#Plant18 continues to progress across the state. 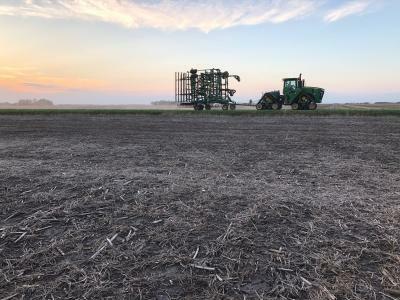 According to Monday’s USDA Crop Progress Report, approximately 40% of Iowa’s expected corn crop has been planted and 11% of the expected soybean crop. 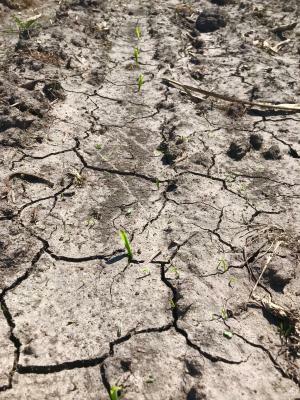 Due to the wet weather across the state last week, #Plant18 and other field activities were put on hold as many farmers only had 2.9 suitable days for fieldwork. Iowa State University Extension and Outreach field agronomists report planting progress and field conditions in their respected regions. Paul Kassel (Region 2): "Field work has been pretty slow in my area. 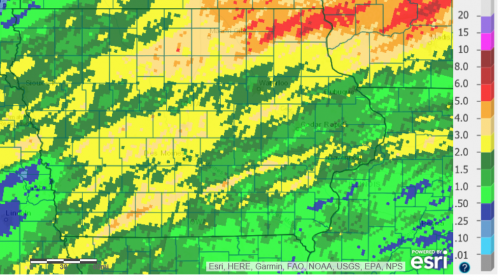 There was some field work and corn planting on May 1; however, some rainy weather kept farmers out of the field for most of the next week. Field work resumed again on May 6. However, some fairly widespread rain chased a lot of people out of the field on May 8. There is quite a disparity in field work progress in my area. The top two tiers of counties – Clay/Dickinson over to Hancock/Winnebago – have been kept out of the field for the most part – except for this past weekend. The area south of highway 3 has had better luck getting in the field. And farmers in western Sac and Buena Vista county have made really good field work progress – with as much as 75% of their corn crop planted." A tractor and field cultivator head for a new field in Clay County. Photo by Paul Kassel. Corn planted the week of April 23 emerging at the ISU McNay Research Farm in the long-term tillage plots. Photo by: Rebecca Vittetoe. Map showing rainfall totals for Iowa over the last week as of May 7, 2018. Source: http://www.weather.gov. Find your local ISU Extension and Outreach field agronomist here!